Brown. H. 46261 Henry Glendinning Brown, 9th Battalion Royal Welsh Fusiliers, killed in action, 2nd November 1916. Son of Peter and J. Glendinning Brown, of 49, Dandsfield Place, Radcliffe, Morpeth. Commemorated on the Thiepval Memorial, Somme, France. Born Ford, Northumberland, enlisted Amble. Formerly 13389, Northumberland Fusiliers. Brown. J. 3461 Trooper James Leonard Brown, 1st Life Guards. Died of Wounds 29th January 1916 aged 19. Son of Peter and J. Glendinning Brown, of 49, Dandsfield Place, Radcliffe, Morpeth. Buried Longuenesse (St. Omer) Souvenir Cemetery, Pas de Calais, France. Born Wooler, Northumberland, enlisted Amble. Curry. G. 1459 Lance Corporal George Curry, 1st/7th Bn. Northumberland Fusiliers. Killed in Action 6th February 1916. Son of William and Mary Curry, of 1, Dandsfield Place, Radcliffe, Morpeth, Northumberland. Commemorated Special Memorial G.1, Maple Copse Cemetery, Ypres, Belgium. Born Morpeth, enlisted East Chevington. Foster. 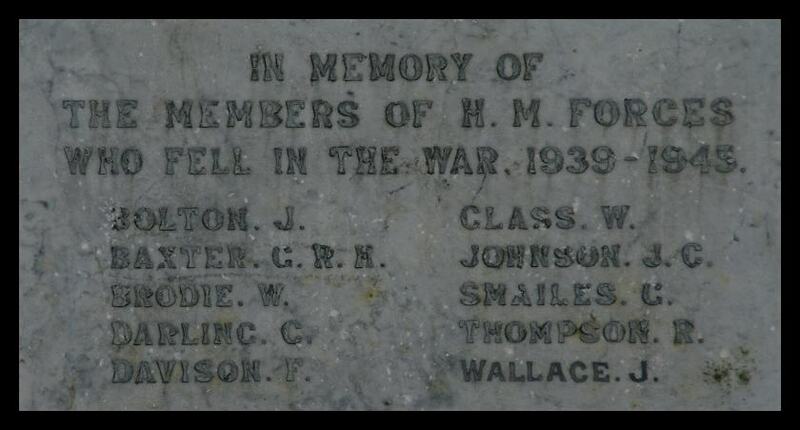 J. W. Possibly...2290809 Lance Serjeant James William Foster 1st/7th Bn. Northumberland Fusiliers. Killed in Action 19th April 1918 aged 23. Son of William and the late M. J. Foster, of Warkworth Terrace, North Broomhill, Morpeth, Northumberland. Buried Foncquevillers Military Cemetery, Pas de Calais, France. Born Acklington, enlisted Alnwick. Commemorated panel 5 of the Ploegsteert Memorial, Comines-Warneton, Hainaut. Enlisted Alnwick, resided Radcliffe. Formerly 2480 Northumberland Fusiliers. Hedley. F. TZ/767 Able Seaman Francis Hedley, Hood Bn. 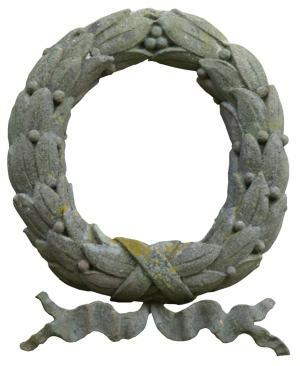 Royal Naval Volunteer Reserve. Died 9am, 3rd July 1917 whilst POW at Reserve Lazarette Munsterlager, from Consumption (also reported died from Pneumonia at Soltau) Buried Hamburg Cemetery, Ohlsdorf, Germany Enlisted 28/10/14 ; Draft for BEF (Bomber) 25/9/16, joined Hood Bn. 25/11/16-4/2/17 missing, POW. A Miner ; b.24/11/1892 ; Next-of-Kin & home address: Parents, George & Mary, 1 Greenfield Terrace, Amble, Northumberland, later of: Cross Row, Radcliffe Colliery, Acklington, Northumberland. Jones. J. 20/1068 Private James Jones, 20th (Tyneside Scottish) Bn. Northumberland Fusiliers. Died of Wounds 13th July 1916 aged 22. Son of James and Margaret Jones, of Long Row, Radcliffe, Acklington, Northumberland. Buried Tottenham Cemetery, Middlesex UK., but Grave not identified. (Commemorated on the Screen Wall. Born and enlisted Amble. Marley. E. 296238 Emmerson Marley, 12th (Ayr and Lanark Yeomanry) Bn. Royal Scots Fusiliers. Killed in Action 30th June 1918. Buried Aval Wood Military Cemetery, Vieux-Berquin, Nord France. Born Greencroft Durham, enlisted Alnwick, resided Radcliffe. Mitchison. A. 20/1097 Private Alexander Mitchison, 20th (Tyneside Scottish) Bn. Northumberland Fusiliers. Killed in Action 12th June 1916 aged 42. Father of Hannah Davison Mitchison, of 3, Eastgarth Avenue, Amble, Morpeth, Northumberland. Buried Albert Communal Cemetery Extension, Somme France. Nairn. W. 2786 Private William Nairn, 1st/7th Bn. Northumberland Fusiliers. Killed in Action 26th April 1915 aged 23. Son of Mary Ann Nairn, of 5, Leslie Row, Radcliffe, Morpeth, Northumberland, and the late Peter Nairn. Commemorated Ypres (Menin Gate) Memorial, Ypres, Belgium. Pitchford. A. 17518 Private Albert Pitchford, 8th Bn. Yorkshire Regiment. Killed in Action 10th July 1916. Commemorated Thiepval Memorial, Somme France. Born and enlisted Amble, resided Radcliffe. Buried Duisans British Cemetery, Etrun Pas de Calais, France. Enlisted Alnwick, Born and resided Radcliffe. Rutter. 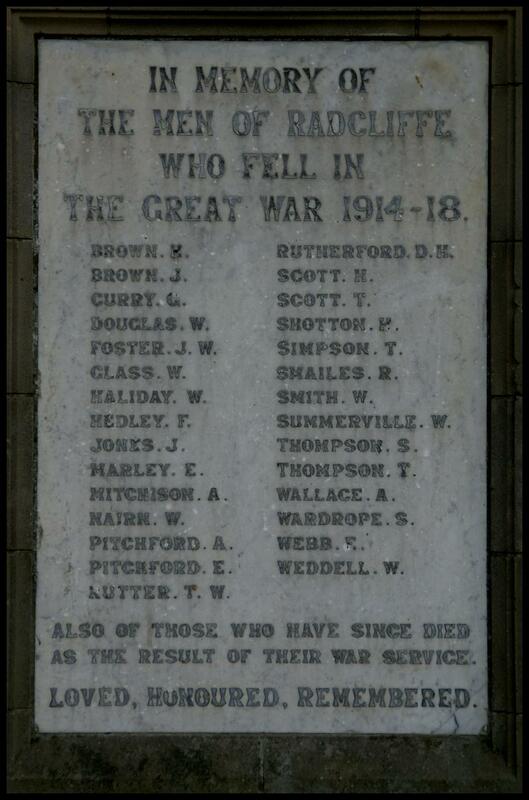 T. W. 13409 Private Thomas William Rutter, 13th Battalion Northumberland Fusiliers. Died 26th September 1915 France and Flanders. Born Amble, Enlisted Amble. No known grave, Commemorated on the Loos Memorial, panels 20-22. Rutherford, D.H. 235179 Private David Henry Rutherford, 1st/4th Bn. Northumberland Fusiliers. Died of Wounds 21st December 1917. Son of Mr. G. R. Rutherford, of 308, Welbeck Terrace, Pegswood Colliery, Morpeth, Northumberland. Buried Lijssenthoek Military Cemetery, Poperinge, West-Vlaanderen, Belgium. Scott. H. Donkeyman Henry Scott, S.S. "Saxon Briton" (Grangemouth) Mercantile Marine. Died 6th February 1917 age 59. Son of the late William and Ann Scott; husband of Elizabeth Scott (nee Dobson), of Cross Row East, Radcliffe, Acklington, Northumberland. Born at Shilbottle, Northumberland. Commemorated Tower Hill Memorial, London. Scott. T. 51314 Private Thomas Scott, 1st/7th Battalion, The King's (Liverpool Regiment). Killed in Action 20th September 1917. Commemorated New Irish Farm Cemetery, Ieper, West-Vlaanderen Belgium. Born Togston, enlisted Amble. Formerly 24306 Northumberland Fusiliers. Occupation (1911) Coal miner shifter. Shotton H. 57856 Serjeant Hugh Shotton, 18th Battalion The King's (Liverpool Regiment), Killed in Action 20th April 1918. Commemorated Tyne Cot Memorial, Zonnebeke, West-Vlaanderen, Belgium. Hugh was the son of John and the late Tamar Shotton of Radcliffe. Born Choppington, enlisted Amble. Formerly 1480 Northumberland Fusiliers. Occupation (1911) Coal Miner (putter). Simpson. T. 290695 Lance Serjeant Thomas Simpson, 1st/7th Bn. 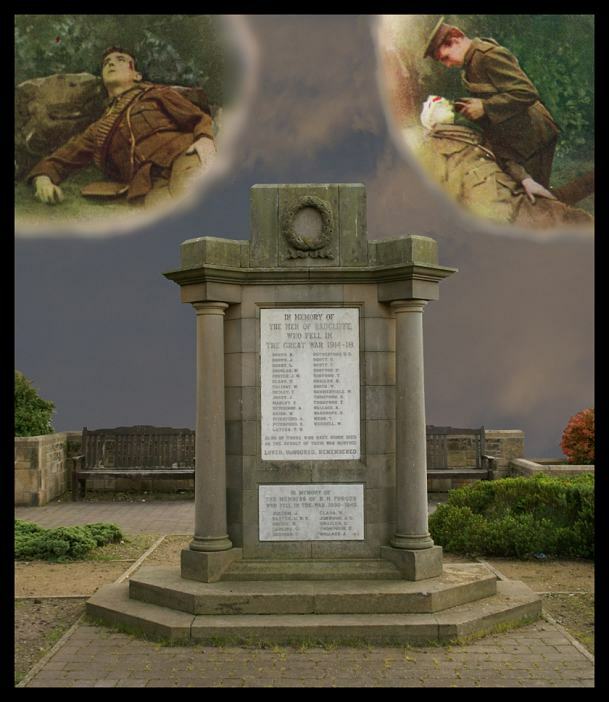 Northumberland Fusiliers, Killed in Action 26th October 1917. Commemorated Tyne Cot Memorial, Zonnebeke, West-Vlaanderen, Belgium. Thomas was the son of George and Isabella Simpson of Long Row North Radcliffe. Born Amble enlisted Alnwick. Occupation (1911) Coal Miner (putter). Smith. W. 21/1646 Private William Smith, 21st (Tyneside Scottish) Bn. Northumberland Fusiliers. Killed in Action, 1st day of the Battle of the Somme, 1st July 1916 aged 23. Son of the late John and Ellen Smith, of 32, Leslie Row, Radcliffe, Morpeth, Northumberland. Commemorated Thiepval Memorial Somme France. 2497 Private William Summerell, "A" Coy. 1st/7th Bn. Northumberland Fusiliers, Killed in Action 22nd February 1916 aged 35. Son of Tom and Margaret Summerell, of Amble, Acklington; husband of W. Summerell, of 13, Long Row North, Radcliffe, Acklington, Northumberland. Buried Lijssenthoek Military Cemetery, Poperinge, West-Vlaanderen Belgium. Wallace. A. 263078 Corporal Alexander Wallace, 1st/5th Bn. Northumberland Fusiliers. Died 26th October 1917. Buried Cement House Cemetery, Langemark-Poelkapelle, Belgium. Husband of Isabella Wallace of Long Row South Radcliffe. Occupation (1911) coal miner hewer. Born Gateshead Durham, enlisted Alnwick. Webb. E. 1673 Corporal Edmund Webb, 1st/7th Bn. Northumberland Fusiliers. Killed in Action 15th September 1916 aged 19. Son of the late Robert and Mary Webb, of Radcliffe, Northumberland. Commemorated Thiepval Memorial Somme France. Enlisted Amble. Weddell. W. 238063 Private William Weddell 2nd Bn. South Staffordshire Regiment. Killed in Action 5th October 1918. Also Those Who Have Died as a Result of Their War Service - Loved, Honoured, Remembered. Baxter. G.R.H. 14375568 Trooper George Robert Horner Baxter, 53rd Regt. Reconnaissance Corps, R.A.C. Died 2nd September 1944 aged 20. Buried Yaucourt-Bussus Communal Cemetery, Somme, France. Brodie. W 4264829 Serjeant Walter Brodie, Nottinghamshire Yeomanry, Royal Armoured Corps. Died 3rd November 1942 aged 34. Commemorated Alamein Memorial Son of Robert and Polly Brodie; husband of Ivy Helena Brodie, of Wooton, Oxfordshire. Born Amble Northumberland. Glass. W. C/SSX 19503 Leading Seaman William Glass Royal Navy H.M.S. Tracker. Died 3rd November 1944, Aged 24. Buried Chevington Cemetery, Sec. H. Grave 294. Son of William and Elizabeth Glass. Thompson. R. 4267206 Sergeant Robert Thompson, Reconnaissance Corps, Royal Armoured Corps. (46th Regiment) Died 2nd March 1943 Commemorated Medjez-El-Bab Memorial Tunisia. Son of Edward and Isabella Thompson; husband of Maria Thompson, of Amble, Northumberland.